Killer Characters: Like Sleeping Beauty! When I went to work this morning…. My colleagues burst through the library doors, weighted down by gravestones, skeleton parts, and a giant black spider. I’ve never been a big lover of Halloween, mainly because, frankly, I don’t consider being scared at all fun. Clearly, in that, I am in the minority. I’m very confused. The time frame is seems right. It was the middle of October only the other day. But I feel like I’ve been asleep for a hundred years. I glanced at the calendar behind the circulation desk and got the shock of my life. Good heavens, can that be right! 2017 all ready? 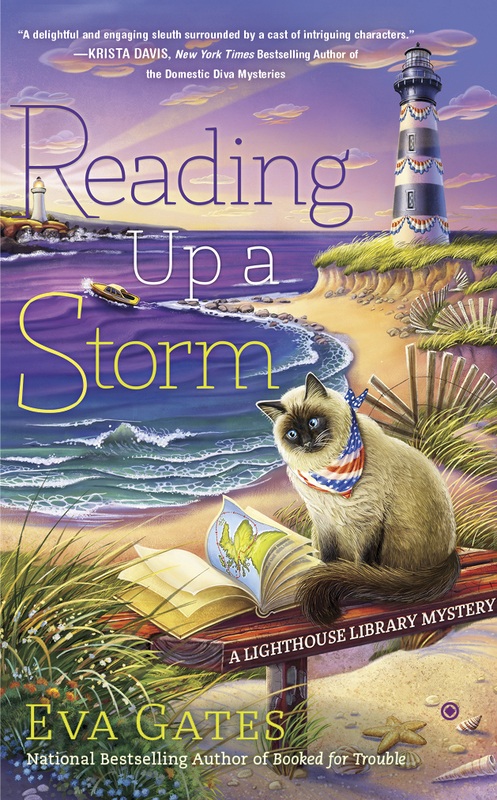 The last thing I remember is when Eva Gates put the finishing touches on Reading up a Storm, the third book chronicling my adventures at the Bodie Island Lighthouse Library. All was resolved, including my love life (at least for now), and I went happily to bed. And now two years have passed! Everyone is acting as though nothing has happened and all is back to normal. Am I Sleeping Beauty, or just a revitalized cozy character? SAVED! 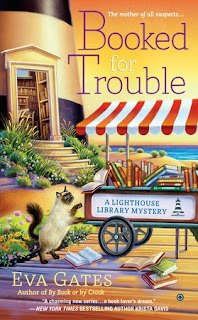 Yes, Lucy Richardson, Charles the Library Cat, Butch the handsome cop, Connor the equally handsome mayor, and the whole gang will be back, sipping coffee and munching pastries at Josie’s Cozy Bakery, and solving crimes in the lighthouse. Even the ever-scheming Louise Jane with more tricks up her sleeve. 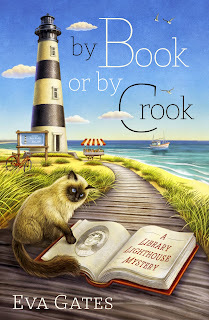 The Lighthouse Library series fell victim to Penguin Random House’s decision to trim their mass market paperback line. Being a work-for-hire, that seemed to be the end of the series. But the good people at Crooked Lane wanted to continue it, and the good people at Penguin kindly gave me the rights! I have just signed a contract with CL for three more books in the series. Look for book 4 (as yet unnamed) in spring 2018. Let’s celebrate with a contest! I have large print copies of each of the three Lighthouse Library Books, By Book or by Crook, Booked for Trouble, and Reading Up A Storm. Winner’s choice. If you’ve already read the books, large print makes a nice donation to your library or senior’s residence or a gift to a hard-of-seeing friend. Please leave a comment her to enter. Include your email address so I can contact the winner. (or send me an email if you don't like to do that) Contest ends Friday evening. US and Canada residents. I'm so happy to hear the series will continue!!! My local library would be so happy if i win. Love the characters in this series and looking forward to reading more about them. Congratulations on the continuing series and I would love to enter for a large print book. Thanks everyone. I'm delighted at the outpouring of support I've gotten since I made the announcement about the series being saved. Cozy readers are the best. Great news! Spring of 2018 is a long ways off for me but sure too soon for you. Great news! And a very nice giveaway. Thanks. That's wonderful news! Congratulations!!! Thanks for the chance to win too! Glad to hear the The Great series will be continuing. What marvelous news! The "evil" publisher has been worked around. Not evil at all. They gave up the copyright which they were under no obligation to do. I'm grateful for that. I love this series! I'm so glad it is continuing, looking forward to book #4. Congrats! Yay!!!! Absolutely love this series and I am so glad you get to keep doing it!!!! My old eyes really like large print. Thanks for the contest. I'm so glad this series survived to see another day. I am so happy for you!!! I am looking foward to the return of the series!!! Please don't enter me in the contest. The covers of your books caught my eye right away. Congrats and I am looking forward to reading your books. I love the covers...lighthouses are a big passion. This is a great opportunity! I'm so glad the Lighthouse Library series was saved. Thank you for this wonderful giveaway. I love this series. Enjoyed the first 2 books very much. So happy your series was saved, so many of the ones I read were not. I love to read large print books, much easier on my eyes. I've had trouble seeing since I was 9 and I always get the large print if available. Congratulations of the release of Reading Up A Storm. pgenest57(at)aol(dot)com Thank you for this wonderful opportunity!! Ooh pick me please! I LOVE large print and I would love to read your books. I also leave reviews on all venues. Hint hint, pic me! Lol email is jlabat@mail.com. I know it's a strange email. My hubby chose it. Everyone thinks it's gmail but it's not. Thank you for the chance. This is such a nice giveaway. Congratulations, Patty! You win. Keep an eye out for my email. Patty, I wrote to the email address you gave above and it bounced back. Can you send me an email please. vicki at vickidelany dot com.